2015 was not a year where I focused on reading, but like the booknerd I am I decided to change that in 2016. 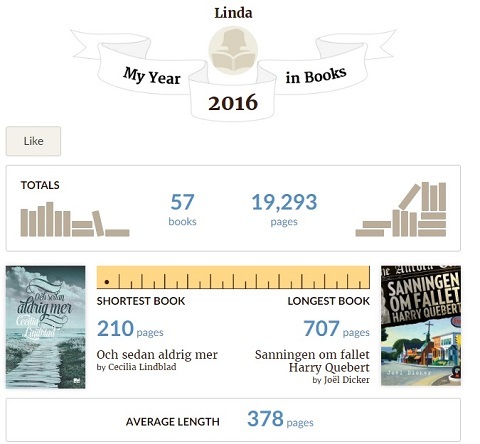 I created a goodreads account to track my progress, and set the goal to 50 books, which I figured a toddler mom with a fulltime job should be able to do. It is after all less than one book a week. It is hardly a surprise that I mostly read Swedish crime fiction, but I had no idea if I had read books mostly by male or female authors, so 58% female authors was a pleasant surprise.